March Madness provides an incredible opportunity for coaches everywhere grow by learning from some of the best in the business. We all know coaches share (and steal) plays from each other, it’s a natural part of the game. So what better chance to do so than in March? With over a hundred high quality games this month during the men’s and women’s NCAA, NIT, CTI and CBI tournaments, coaches at home ought be locked in into these contests for professional development purposes. Another thing we all know in this industry: if you aren’t growing, then you’re cheating yourself! 1. 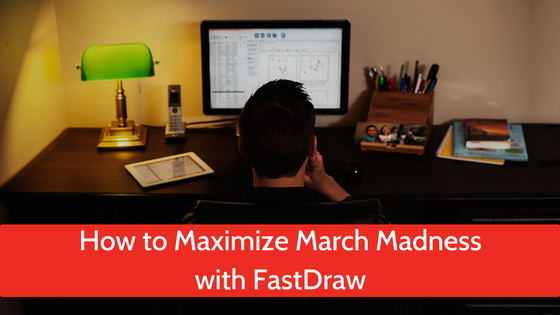 The most obvious tip, of course, is to watch games with FastDraw open on your desktop or iPad. (Don’t have FastDraw? Get it now!) Take advantage of our user-friendly play diagramming software and sketch up plays in no time. Set up a second screen if possible for multi-game watching, and get comfortable with your remote control for quick rewinding! When you finish a play, use the FastTrade feature to share it with your coaching staff or colleagues in your network. Pro tip: Save your work to our cloud server frequently using the Sync feature. 2. Visit the PlayBank regularly for free pre-drawn plays. Our team of amazing contributors will be posting the most effective sets from every team in the tournament. 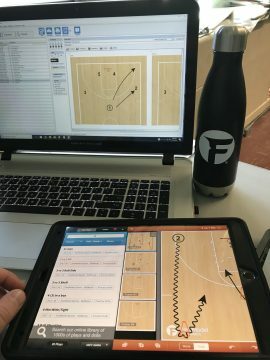 FastDraw users can download these plays directly to their library to keep as is, or customize from there to fit their team. There are also options to email, print, download, save and/or export plays as PDF (see below and click here for guide). 3. Follow @FastModel on Twitter. Engage with us and the coaching community by commenting, retweeting and sharing the best content from the tournament. This medium provides a great discussion forum for chalk talk. Use the hashtag #GrowTheGame with us to emphasize this goal and share basketball knowledge with others. Pro tip: Follow your favorite contributors on Twitter as they share tourney insights along with #XsOs. Hall of Fame tip: Check out our Instagram account for some exclusive behind the scenes content. 4. Subscribe to the FMS Newsletter. We will be sending out frequent emails with #XsOs, blog posts, free playbooks and more directly to your inbox throughout the tournament. Pro tip: Check your spam and mark our address (messages@fastmodelsports.com) as “not spam” to make sure you don’t miss any of these important emails. 5. Check out this blog for in-depth content. This will be the place for more detailed written previews/recaps, upset #XsOs, regional video playbooks, and other breakdowns of all the tournament action. Looking forward to engaging with you all this month and growing the game of basketball!